Almost thirty-five percent of the software installed on personal computers worldwide was pirated in year 2004. In 2004, the world spent more than $59 billion on commercial packaged PC software, up from $51 billion in 2003. Software piracy is the major area of concern for the software publishers worldwide. After spending lot of time on study and research, we at Ashtech Digital Concepts have developed an anti-piracy tool for the web based applications developed in ASP running on IIS platform. Now you can protect your web based applications from getting it illegally copied. Lock Integrator, the module which will be integrated into your ASP applications. License Key Generator, the module which helps software publishers to generate the license key for their ASP products for a particular customer. This module upon integrating into any ASP application, protects the application from being illegally copied and used on another machine. Integration is very easy and can be done in 3 easy steps within 10-minutes. Once integrated properly, ADC - ASP Software Lock takes over the control till your ASP application is properly licensed on the user's machine. If your application is not registered on the user's machine, ADC - ASP Software Lock will automatically display the registration form. After filling up this form by your customer, you will get an email with the user's details and a unique customer ID. ADC - ASP Software Lock will generate the unique customer ID which is unique throughout the world and bound with the hardware configuration of the user's computer. Once you receive this information by email, you can then use License Key Generator to generate the unique License Key for your application for that particular customer and then send that license key to your customer. This module helps software publishers to generate the License Key specific to their ASP application for a particular customer. The generated license key is generally between 40-45 digits long and is bound with the hardware configuration of the customer on which your ASP application is running at customer's end. Licensing information is written in the windows registry. ADC - ASP Software Lock has been developed in such a way that if user tampers the registry settings or if user tries to replicate the same registry settings on another machine, your ASP application will stop functioning till the valid license key is obtained. Each License Key Generator module shipped to the software publishers work on a different logic. 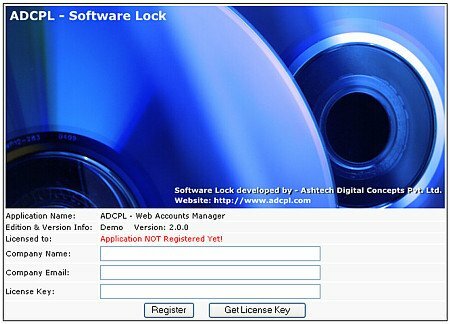 Thus one software publisher who is using ADC - ASP Software Lock can not generate the license key for another software publisher's software who is also using the ADC - ASP Software Lock. License Key generated is tightly bound with the hardware configuration of the computer on which your ASP application is running. Thus even if your application is copied on a different machine it will not run until the new License Key is shipped to the customer. MS. Windows 2000 / XP or Higher with IIS 5.0 or higher.